Neon Nettle: Hillary Clinton, Barack Obama, and George Soros orchestrated a coup within the Vatican in February 2013 to overthrow conservative Pope Benedict, according to emails released by WikiLeaks. With the huge influence that the head of the Catholic Church has over the global flock of loyal Christians, the motive behind installing an operative who will “play ball” is clear. Opinion: I have to admit I was a little skeptical when I started this post. 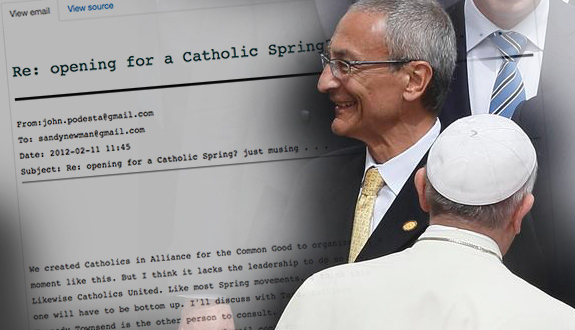 But after a Google search on Catholic Spring it became clear that the conspiracy has legs. Beginning in 2007, orthodox Catholic writers including myself wrote dozens of articles in an attempt to expose the funding and duplicitousness of two fake Catholic groups: the George Soros-funded Catholics in Alliance for the Common Good and Catholics United. When Mr. Obama was running for president, Catholics in Alliance for the Common Good and Catholics United tried to neutralize the abortion issue throughout his campaign—suggesting that his proposals on social justice issues like poverty were the real way to reduce abortion rates without restricting abortion rights. Benedict and conservative bishops were/are right to be against abortion but for the wrong reason. According to Catholic doctrine that has been played down in recent years, unbaptized infants are to spend eternity in comfort in a non-Scriptural place called limbo, underscoring the need for Baptism. Benedict needed to be replaced by a progressive that better fit the Obama new world order. And they got what they wished for. “Stuck in the Middle-Ages.” This is a kind of post modernist’s mantra for anything of lasting value or tradition. Our “archaic Constitution.” “Out dated” gospel message of salvation.” “Ancient myths and legends” found in Scripture. The church redefining itself; first through Augustine; then the papacy; then post-Reformation critics like Daniel Whitby and Wm Hendriksen; and of late, the “feel good gospel” of Joel Osteen. Now the pope and the deep state are walking hand in hand searching for world unity and a leader that is certainly not Jesus of Nazareth.